Student Jacob Derksen (left) and religion professor Sam Thomas move a cage to cover and protect plants from critters. California Lutheran University is teaming up with 100 pounds of worms to compost food waste from its dining hall. The university's goal is to turn 20,000 pounds of food waste into compost over the next two years, said Jacob Derksen, a junior majoring in biology who helped organize the project. The compost will be used in a half-acre garden on campus. CLU sells the food it grows in farm stands on campus and also donates it to the Manna food bank in Thousand Oaks. "We're trying to make the campus more sustainable," Derksen said. "We want to get students thinking about sustainability. We have some of that mentality at this school, but it could be better." CLU recently received a $5,000 grant from the city of Thousand Oaks for the project. The money will help buy a composter as well as materials to build a structure that will protect the composter from sun, rain and creatures. Eventually, the university hopes to sell the compost to raise money that it would reinvest in the garden. But the project is about more than simply composting, said Sam Thomas, a religion professor who has been working on the garden since its start five years ago. It will also be about teaching and connecting with the community, Thomas said. 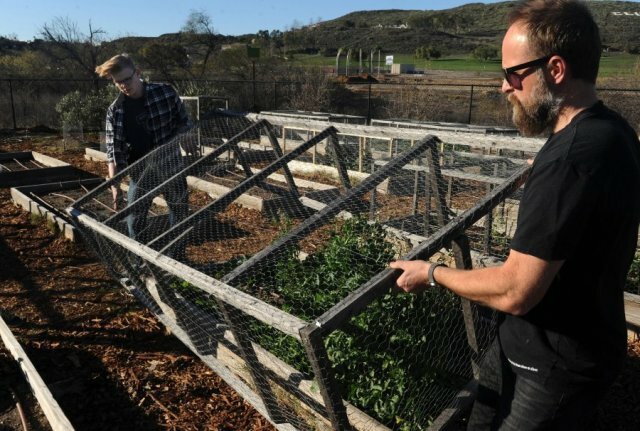 CLU plans to incorporate composting into courses on soils, environmental literature, math and Spanish — involving students in the humanities as well as the sciences. The university will also hold workshops for people in the community. The project started when Derksen came to a turning point in his life. He had taken Thomas' environmental ethics class and realized he may have found his life's calling. Derksen, who had been a pre-med student, told Thomas he wanted to do a project that incorporated what he learned in his class. Together, they came up with the composting project. "I liked pre-med, but I love this," said Derksen, who now plans to pursue a career in environmental biology. Since then, Thomas and Derksen have been working with the university's dining hall and facilities department to coordinate the project. CLU, which contracts with Sodexo for dining services, already composts food waste. But now the dining hall will separate out vegetables and grains, which worms eat, from meat, oil and dairy products, which they don't. "Worms don't want any proteins," said Patti Yantzer, CLU's general manager for Sodexo. "It's the opposite of the Atkins diet." Ultimately, Thomas hopes to create a model that other universities can replicate, he said. Generally, composting is done on a small scale, in people's backyards or at the industrial level. But Thomas envisions creating videos or hosting workshops for local restaurants or school kitchens so they can do their own composting. Restaurants, in particular, might be interested because of new state regulations on reducing food waste that goes into the landfill, he said. "People will be looking for more creative ways to keep food out of the landfill," Thomas said, "not only because it's the right thing to do, but because of the new regulations."